The TP304 ships with the TRF-2100 and shipped with several older models including the TF7100HDPRVt. 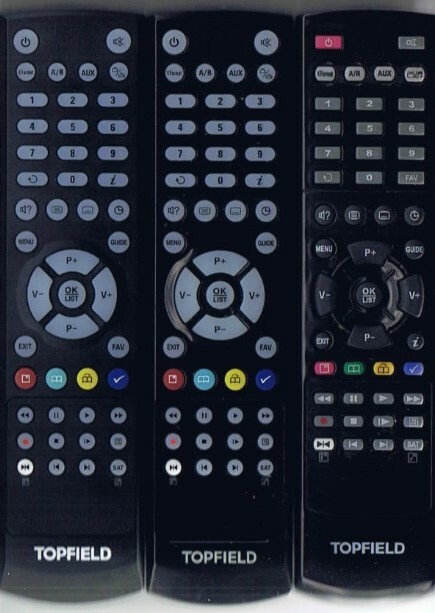 There are three slightly different versions of this RCU; the one on the left is the current version, and the one on the right is the original version. The one in the middle is an intermediate version (some keys are larger, including the function keys). The current version is much lighter than the earlier version and has a black matt finish rather than gloss finish of the earlier versions. The Topfield lettering at the bottom of the RCU is larger. The TP304 has been replaced by the TP804.